1. Place the game board in the middle of the table. 2. Place the grey round marker on the first space of the round track. 4. Sort the 72 factory tiles by back side (A and B) and shuffle each stack separately. Place 18 of the A-tiles face up on the game board: 16 in the action area, and 2 below the sales offices. Remaining A and B tiles are placed next to the game board. 5. Place the 10 black neutral workers in a pile near the game board. 6. Shuffle the 10 demand tiles. Put one face-up tile on each space in the two market demand areas (if the two markets now happen to be identical, reshuffle the tiles). 7. Shuffle the 26 contract cards without an 'S' and put them in a face down deck next to the game board. The top 3 cards are revealed and put face up next to the deck to form the card display. Randomly place the player order discs on the player order track and give each player the corresponding triangular order tile. The scoring markers are placed on the spaces on the scoring track corresponding to each player's player order (i.e. 1st player places their car on space 1, 2nd player on space 2 and so on). Whenever a player scores victory points during the game, advance their scoring marker on the track. The first player in the player order takes 6 autobucks, the 2nd player takes 7, the 3rd player takes 8, and the 4th player takes 9 autobucks. 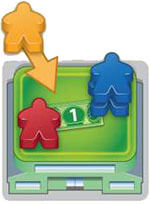 You may keep your money hidden from other players during the game. Shuffle the 4 contract cards marked with 'S' and deal 1 to each player. Unused cards are removed from the game. 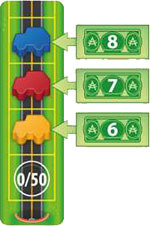 The two oval car tiles are returned to the game box - they are only used in the advanced game described at end of the rules. 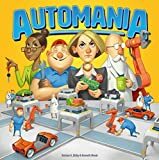 Each round begins with an ACTION PHASE, in which players use their workers to take tiles for their factories and produce cars. Produced cars are placed on ships, heading for one of the two markets. Players take turns in the order shown on the player order track. Each player takes one action, then the next player follows. This continues until all players have withdrawn. To take an action, first place workers on one of the 9 action spaces. If the space is empty, place 1 of your workers in the space. If you want to use an action space that is occupied by another player's workers you must place 1 worker more than the number of workers already there. The workers of the other player are then returned to their owner, who may use them again on their own turn. Important: You are not allowed to choose an action space with your own workers on it. If you want to use the same space again, you must wait until another player replaces your workers. When you use the special production space (in the corner), you immediately carry out the action as described on the next page (do not take a tile). However, if you choose one of the action spaces on top or to the left of the action area, you must take one tile from the row/column of the chosen space before you carry out the action. If there are no available tiles in the row/column, you cannot choose that action space. When taking a tile, the tile must either be placed in your factory or discarded. 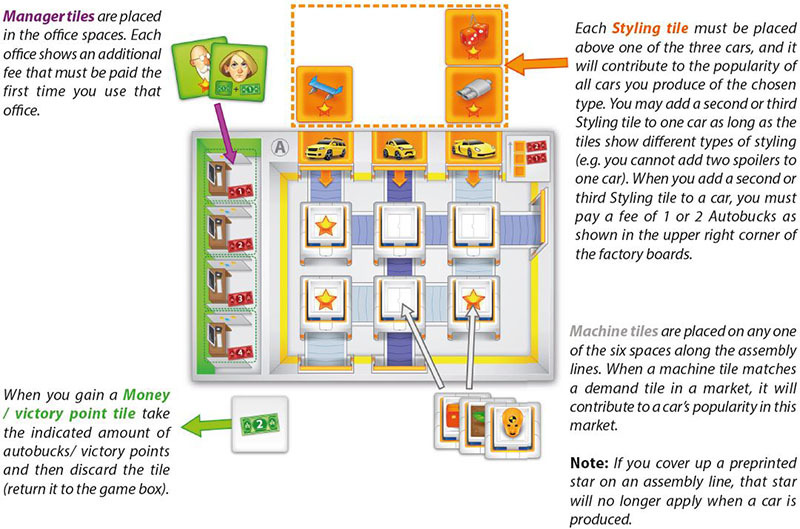 Once placed, a tile cannot be moved, but it may later be replaced by another tile: Machine tiles may be replaced by any other machine tile, while manager tiles and styling tiles may only be replaced by other manager and styling tiles with the same image (same portrait or same styling part). All tiles that are replaced, are removed from the game and returned to the game box. Yellow player chooses an action space with 1 blue worker. She places 2 of her own workers on the space, and the blue worker is returned to the blue player. Yellow player then takes the speedometer tile, and produces a family car. Tip: When you use neutral workers, placing them together with at least one worker in your own color will help you remember that they belong to you. Note: To choose a car production action, you must be able to pay for the car (see next page). After you have taken and placed a tile, you finally carry out the action of your chosen action space. The action will either be to Produce a car or Draw a contract card. 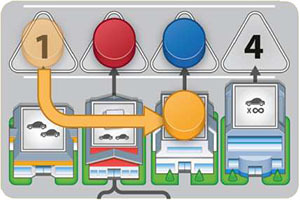 If you choose a production action, you must pay the shown cost and produce the shown type of car. If you use the corner space you choose which type of car you want to produce, and pay the corresponding cost (1 for city car, 2 for family car, 3 for super car). 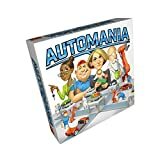 On your factory board you have one assembly line for each type of car. Decide which of the two markets you want to ship your car to. Then compare the demand tiles of this market with the symbols on all machine tiles along the assembly line of the car you produce. 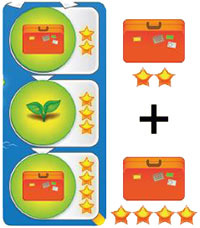 Each demand that is met by a matching machine tile on your assembly line is worth 2-4 stars (popularity). Add to this all visible stars along the active assembly line, on manager tiles, and on all styling tiles you have for this car type. The total number of stars is the car's popularity score. Place a car tile on the matching ship space above the chosen market. 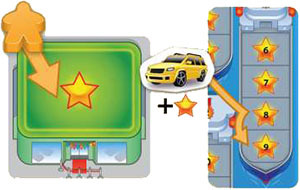 If the ship space matching the car's popularity score is occupied, you must place the car on a vacant space with a lower value. 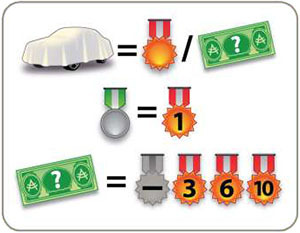 Ship bonus: If your car tile is placed on a ship with a gold medal, immediately score the shown number of victory points. Double demands: If a market shows two identical active demands, you need two matching tiles in your production line if you want to score both demands. If you have only one tile, you only score one of the demands (the highest one). Top car: If you produce a car with 18 or more popularity, the car is immediately shipped to the market and sold. 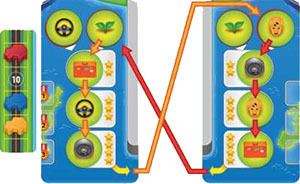 Choose the reward of any one of the sales spaces for the chosen market (see Sales phase), and then return the car to your factory. This sale does not count towards your sales limit in this turn's sales phase. You may take back one of your cars from the ship at any time. If you run out of a type of car, you may therefore take back a car of that type in order to produce it again. Even if you cannot place a car on a ship, you still have to pay for the production action. When you choose this action, you must either take one of the face up cards from the card display, or draw the top card from the deck. When taking a card from the display, immediately replace it with the top card from the deck. Special situation: If there are no more cards, score 1 victory point instead of taking a card. Whenever you produce a car, you may play exactly one of your contract cards if the produced car meets all requirements on the card. Show the card to the other players, then place it face down under your factory board. It will be worth victory points at the end of the game. When you play your starting contract you immediately gain 3 Autobucks. You may only play one contract card each time you produce a car. As long as the car meets the requirements, you can play the contract card, even if you - due to lack of space - are forced to place the car on a lower ship space. These spaces may be used by any number of workers from any number of players. Workers here are not «replaced», and a player may use the space several times in a row. Sponsor space: At any time on your turn (in addition to taking an action or withdrawing), you may place workers on this space to take 1 autobuck from the supply per worker placed. Marketing space: When you produce a car (right before you place it on a ship), you may place workers on this space to increase the popularity of the car by 1 for each worker you place. This may help you reach the requirements on a contract card. Take 1 autobuck per worker you place on the Sponsor space. Place worker(s) on the marketing space to improve the popularity of a car being produced. Instead of taking an action, you may withdraw. You may not reenter the round and you cannot use any workers that are returned to you after you withdraw. To withdraw, place your remaining workers on the sponsor space and take 1 autobuck for each worker. Then place your player order marker on a vacant sales office. The chosen sales office determines how many cars you may sell this round, as well as your play order for the next round. It may also provide a bonus which is awarded immediately when the sales office is chosen. When all players have withdrawn, the sales phase begins. 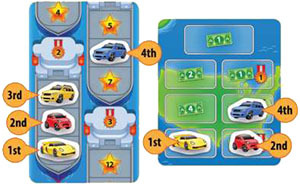 In this phase, players may sell their cars for money and/or victory points. Start with the car with the highest popularity score. The player who owns this car must now decide whether to sell this car or to pass and leave the car on the ship. If the car is sold, the owner places the car on any free sales space in the North American market and takes the reward shown in the space. 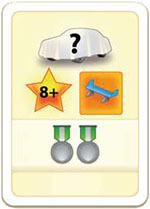 Then continue with the car with the second highest popularity score: The owner of this car must now decide whether to sell. Continue until all cars on the North American market have had a chance to be sold. Then resolve the ships above the European market in the same way, start- ing with the car with the highest popularity score. The topmost sales space in each market is not limited to one car per round - any number of cars can be sold to these spaces. Cars that are not sold remain on the ships until next round. Important: Each player may never sell more cars than their sales office allows. This limit applies to your sales in both markets combined. Note: Having a sales manager will allow you to sell more cars. In each market, only one car can be sold in each row! 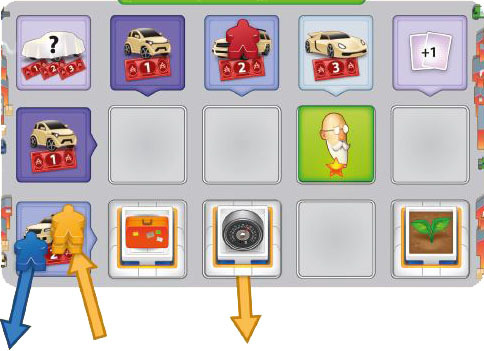 The yellow super car is sold first, and yellow player chooses the sales space with 6 autobucks. Then the red city car is sold. The yellow family car is third, but yellow player decides to pass and leave this car on the ship. Finally the the blue family car is sold. 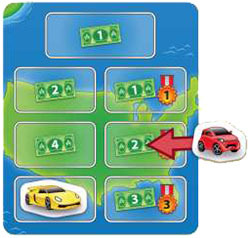 Two player game example: Since a car has already been sold on the lowest row, Red player can only sell to one of the spaces on the second row. Advance the round marker to the next space. The player who is furthest behind on the scoring track (If there's a tie for least number of points, it is the tied player who chose the sales office with the lower number) gets to choose which pending demand tiles should advance to the first active space in each market. The player must advance the pending tiles from the same position (left/right) in both markets, but the player gets to choose if the two left tiles advance or if the two right tiles advance. The active demand tiles are pushed one space down, and the tile that leaves the market is put on the empty pending space in the opposite market. Remove all cars from sales spaces and return them to their owners (cars on ships remain in place). All factory tiles remaining on the game board are removed from the game (tiles in players' factories remain in place). Place 18 new tiles face up on the game board: 16 in the action area and 2 below the sales offices (use A-tiles for round 2, B-tiles for round 3-4). Move all player order markers to the player order spaces, in the order given by the sales offices. Each player then takes the player order tile matching their new player order. 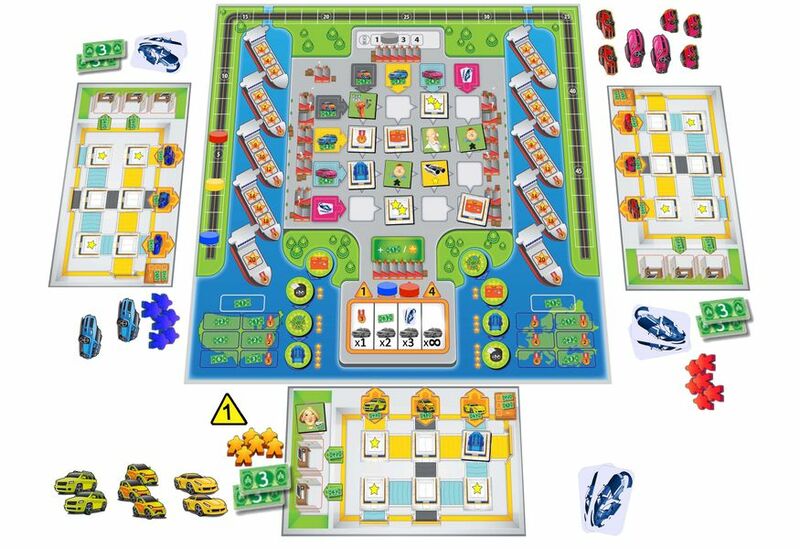 All players take back their workers from the action board. 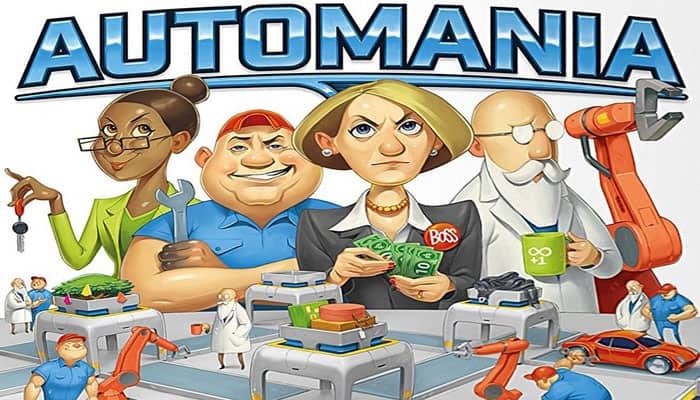 Players who have staff manager tiles in their offices check to make sure they have a number of neutral workers equal to what is shown on these tiles. The yellow player chooses to advance the right pending tiles in both markets. The demand tiles are slid down, and the tiles that leave the markets (speed tile and suitcase tile) go onto the vacant pending space in the opposing market. After the sales phase in the fourth round, the game is over. Players now calculate their final scores. Each car remaining in the North American market is sold for 1 autobuck. Each car remaining in the European market is sold for 1 victory point. 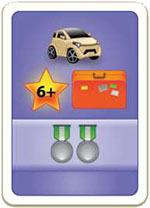 Silver medals on a player's completed contract cards and on tiles currently in their factory are worth 1 victory point each. The player with the most remaining money scores 10 victory points, the player with second most money scores 6, and the player with third most money scores 3 points. E.g. in a 2-player game, the player with the most money scores 10 points and the other player scores 6 points. The player with the most victory points wins. Ties: If two or more players are tied, either for most remaining money or for final number of points, the tie is broken in favour of the player with the lowest numbered sales office (i.e the player who would have been first in player order in the next round). Example: Red player has 12 Autobucks, Blue and yellow players both have 7, Green player has 3. Red scores 10 points. Blue and yellow are tied, but since blue has the sales offce with the lower number, Blue scores 6 and yellow scores 3 points.